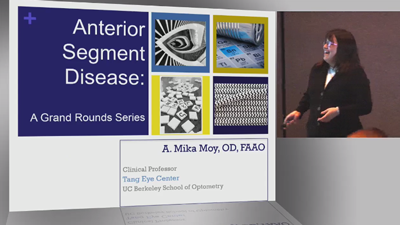 Optometrists play a key role in diagnosing and managing anterior segment disease. When a red eye case falls out of the typical ones seen, the doctor must utilize their diagnostic skills to solve the patient’s problem. The following cases provide the clinician with useful tools to aid in the diagnosis and management of out of the ordinary anterior segment disease. This course utilizes the rapid-fire lecture format to examine recent updates in the diagnostic testing, imaging morphologic characterization, treatment and management of neovascular and non-neovascular age-related macular degeneration. In addition, the findings of recent and ongoing clinical trials are discussed. 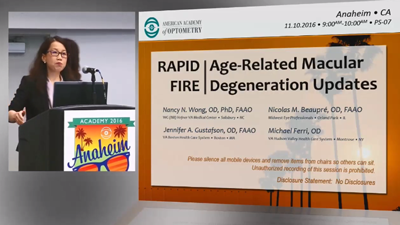 The goal of this course is to educate why diagnosing and comprehensively treating dry eye with an ‘etiology first’ approach achieves long-term success. In contrast, focusing on the sequelae of dry eye leads to long-term failure. The four main areas that will be addressed are as follows: 1. The conventional understanding of dry eye and dry eye status - where are we now? 2. Why desiccating stress is a primary mechanism and a root cause of the majority of dry eye. 3. The comprehensive diagnosis of dry eye. 4. The comprehensive treatment of dry eye. This course will cover various controversies in scleral lens fitting and management, such as: how much oxygen is needed, how much tear exchange is needed, are sclerals ready for mainstream use, and whether conjunctival prolapse is a benign findings or a problem that needs to be managed. Dr. Melissa Barnett is a Principal Optometrist at the UC Davis Eye Center in Sacramento. She is internationally recognized key opinion leader, specializing in anterior segment disease and specialty contact lenses. Dr. Barnett lectures and publishes extensively on topics including dry eye, anterior segment disease, contact lenses and creating a healthy balance between work and home life for women in optometry. She is a Fellow of the American Academy of Optometry and serves on the Board of Women of Vision (WOV), Gas Permeable Lens Institute (GPLI) and The Scleral Lens Education Society (SLS). Dr. Barnett is a spokesperson for the California Optometric Association and a guest lecturer for the STAPLE program. In her spare time she enjoys cooking, yoga, hiking and spending time with her husband, Todd Erickson, also an optometrist, and two sons, Alex (8) and Drew (6). 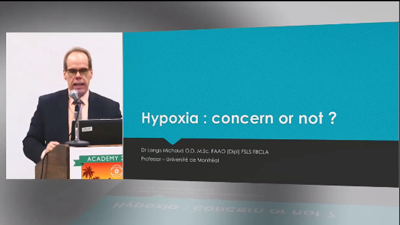 Dr Langis Michaud is graduated from École d’optométrie de l’Université de Montréal in 1986 where he also obtained his Master’s Degree in physiological optics (1998). He is also graduated in public health ( 3rd cycle) from École Nationale d’Administration Publique in Montréal(2006). He is a Fellow of the American Academy of Optometry since 1989 and Cornea and Contact Lens Diplomate since 1994. He is also Fellow of the Scleral Contact Lens Organisation since 2010 and Fellow of the British Contact Lens Association since 2013. Dr Michaud has published numerous articles in peer-reviewed journals and publications or professional reviews. He is an author of more than 35 chapters of book edited in France. Finally he is actually developing a unique longitudinal study project on ocular manifestations of Fabry’s and other lysosomal storage disorders. Because of his expertise he has often been invited to speak in Europe, Asia, and United States. He is a regular speaker at the American Academy of Optometry (Ellerbrock) and at the European Academy of Optometry meeting. Finally, Dr Michaud is the current president of the College of Optometrists of Quebec (Ordre des Optométristes du Québec). Dr. Michael Lipson is an optometrist/assistant professor at University of Michigan’s Kellogg Eye Center. His clinical practice involves contact lenses with emphasis on specialty contact lenses: for overnight corneal reshaping, keratoconus, post-corneal transplant, post-refractive surgery and severe dry eye patients. He conducts clinical research studies on corneal reshaping, vision-related quality of life, myopia control and new lens designs. He lectures nationally and internationally on specialty contact lens and research topics. He is the Vice-President of the Scleral Lens Education Society. He attended Michigan State University, received his OD degree from Illinois College of Optometry. Dr. Melissa Barnett is a Principal Optometrist at the UC Davis Eye Center in Sacramento. She is internationally recognized key opinion leader, specializing in anterior segment disease and specialty contact lenses. Dr. Barnett lectures and publishes extensively on topics including dry eye, anterior segment disease, contact lenses and creating a healthy balance between work and home life for women in optometry. She is a Fellow of the American Academy of Optometry and serves on the Board of Women of Vision (WOV), Gas Permeable Lens Institute (GPLI) and The Scleral Lens Education Society (SLS). Dr. Barnett is a spokesperson for the California Optometric Association and a guest lecturer for the STAPLE program. In her spare time she enjoys cooking, yoga, hiking and spending time with her husband, Todd Erickson, also an optometrist, and two sons, Alex (8) and Drew (6).